Nearly all Net Lawman documents come with drafting notes to give a background to the document and to comment on what you may want to consider when editing a particular paragraph. You can find them after the end of the document. We’ve placed them here to keep them close to the legal text, but not too close so that they might be confused as part of the document itself. We intend that you delete the notes once you have finished editing the document. You may want to keep a copy of the original unedited document so that you keep a copy of the notes. We aim to balance the tone and the level of technical detail so as to suit the majority of our customers for any particular document. We do get the balance wrong sometimes. If you think a note isn"t clear, or that we can improve it or how we say something, we"d be very happy to hear your suggestions. We provide the document in Microsoft Word format (Doc or DocX). We try to keep formatting as simple as possible to ensure maximum backwards compatibility with word processors of different types and to accommodate users with different levels of word processing skills. Generally, you may reformat the document as you like. If you do, we recommend using a font type that is easily read, such as Arial or Times, and a font size of at least 10 point. 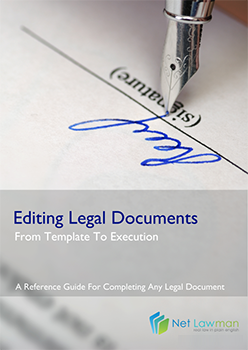 Legal documents do not require any particular format or layout to be valid. Paragraph numbers, indentations, tables and headings may aid readability, but are not required for the document to be legally binding. If you want to use a decorative front cover or company logo on every page, doing so is unlikely to affect the legal validity of the document. If you do, we would advise you to make sure no text that could be interpreted as part of an agreement. Make sure that the person signing has the authority of his organisation to commit it to your contract. In most cases you would know if you were dealing with a junior manager, rather than a senior one. If someone is signing on behalf of someone else (for example, an elderly relative), make sure that the signatory has appropriate power of attorney. Take a copy of the power of attorney document. Your document is not valid unless dated. If you have multiple copies, they are valid only if they bear the same date. If you are exchanging contracts, use a date in the future and not in the past. You don"t need a formal space for the date. The date can be hand written next to a signature. In law there is no requirement for a contract signature to be witnessed by a third party. If your counter-party is unknown to you, or abroad, you may feel more comfortable if you ask for a witness to add his name and address. If you are signing a deed, you must have at least one witness. Wills require two witnesses. Another light level of security can be added by having your counter-party initial each page in the margin. The law on whether electronic signatures can create a binding contract varies from one country to another. The issues are as to whether a document sent by email can be binding and whether an email message is binding. In most countries both are binding if the correspondence clearly shows that the parties intended to be bound and the terms are clearly agreed. Digital encryption and document control processes are available on the Internet. They do provide an additional level of security. That is most important when you are dealing with a counter-party in a country with a weak legal system. We recommend that you make quite clear that you expect both sides to be bound by electronic communication and that your counter-party agrees. Wherever you are in the world, it is most safe if your document is signed in print and received by post or courier. Mere sending is not enough. You must prove you sent it and that the means of sending must have resulted in receipt by your counter-party. Delete the drafting notes (for Net Lawman documents: from the end of the legal text). Format the document in the same font colour, in at least 10 point, and in a font type that is easily legible such as Times or Arial. Spell check your document with a correct dictionary (Microsoft Word often defaults to an American dictionary). Check paragraph numbering (if any) is correct. Read the document again carefully to check that the text runs correctly. We find printing to paper and reading aloud makes spotting errors easier than reading on screen. Make sure the document is signed and dated by all parties. Any contract that creates a financial obligation for payment by a company (such as a loan agreement where the borrower is a limited company) should be registered at the Registrar of Companies after completion. Doing so may give you priority if the company is liquidated, over lenders who have made loans to the company after you have done so. It is important that you retain contracts and legal agreements after they have been completed. The document is a record of exactly what was agreed or done. Without it, proving the details later is far more difficult, especially in the long term. Where the document is only in soft copy (such as website terms and conditions), keep a printed copy of the page before you edit or update it. The paper copy should also be dated. You should keep an original signed paper document carefully. It is a good idea also to keep electronic copies of supporting documents, for example, emails between you and the other party negotiating terms or scans of hard copy letters. The time period in which a claim for breach of contract must be brought is six years. Business documents (the original, signed copy) should be kept for at least for this length of time, and electronic copies could be kept indefinitely. If the document deals with something that takes place over time (such as a lease or regular sale of goods) then the original documents should be kept for six years after the period ends. Common sense as this point may be, you should be as specific as possible in the document so as not to leave room for either party to misunderstand the scope. Usually, we point out and give examples of where being specific is advantageous. Where the commercial deal is of some length, for example because it is a specification of work to be done, you can keep your document "clean" by placing the specification in a schedule. Conversely, if we have provided for a schedule but your words are few, by all means bring them into the body of your document at the point where the schedule is mentioned. If you would like a lawyer to double check the changes you’ve made, Net Lawman offers a document review service. The service aims to give you confidence that your document sets down the terms you want, and that your changes are worded as they would be if a solicitor had written them. For more information, including about prices, please contact our support team at support@netlawman.co.za. Finally, let us say how we welcome you as a customer and hope you find the document you have bought to be as satisfactory as you could have wished. We shall shortly send an email message asking you to comment on the document and our service. Do please help us with this feedback. If you have any other questions or queries, please contact us.